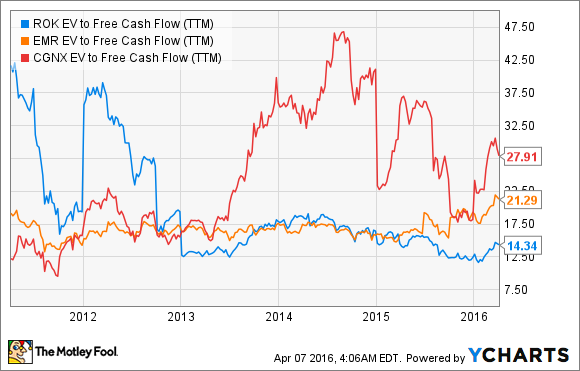 Better Buy: Rockwell Automation or Emerson Electric? Though industrial automation is having a challenging year so far, stocks in the sector continue to look attractive. 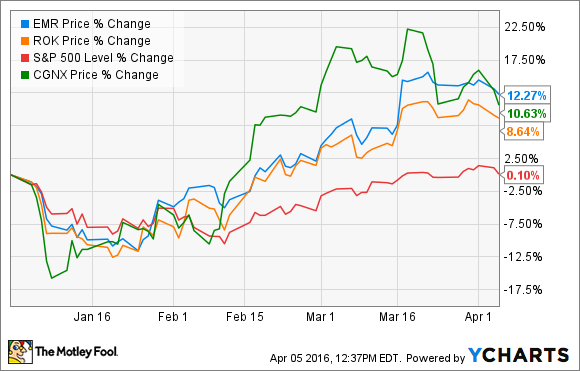 Emerson Electric (NYSE:EMR) and Rockwell Automation (NYSE:ROK) have both outperformed the S&P 500 year to date. As with Cognex Corp. (NASDAQ:CGNX), both companies have substantive exposure to industrial automation. It's somewhat surprising to see such share price outperformance during a period of weak economic growth, but clearly, the market is pricing in a second-half recovery. The question is, which stock is a better buy now? It would be easy to look at the chart above and quickly conclude that the two companies' earnings drivers must be very similar, but actually, they offer different aspects that will give them appeal to different types of investors. Management wants to sell or spin off its network power segment, and recent speculation is focused on Siemens as a potential buyer. The motors & drives and power generation businesses are expected to be sold in 2016, with the remaining storage business expected to be sold in the first half of 2017. At its recent investor conference, CEO David Farr expressed a willingness to aggressively pursue acquisitions. The successful conclusion of these restructurings will create a new, lower-revenue but higher-margin Emerson Electric. Nearly two-thirds of revenue will come from industrial automation, with the remaining third coming from commercial and residential solutions (comprising activities like air-conditioning, refrigeration, home tools, sensors etc). In other words, Emerson isn't a pure-play automation company. However, what isn't going to change is Emerson's ability to generate free-cash-flow (which is important because it's what dividends are paid out of). Internal guidance is for $3 billion in operating cash flow in 2016, and around $2.38 billion in free-cash flow -- a figure 1.9 times last year's dividend payout. In a nutshell, Emerson Electric is the better option for dividend seeking investors looking to combine upside from corporate actions and an improving industrial market (at least in the second half). In contrast, Rockwell Automation is more of a cyclical stock due to its 100% industrial automation exposure -- incidentally, this fact makes Cognex a useful comparison. You can see the difference in the way that Rockwell was forced to cut its 2016 guidance during its first-quarter earnings call in January. The weakening industrial economy hurt Rockwel more than it did Emerson Electric. For example, in November management said it expected 2016 EPS to come in between $5.90 and $6.20, only to downgrade expectations to a $5.70 to $6.20 range in January. There is no doubt that Rockwell is more cyclically exposed, and CEO Keith Nosbusch is candid in discussing the limited visibility inherent in roughly two-thirds of Rockwell's sales -- leaving the company at risk of having to reduce guidance if end-market conditions get worse. No matter. Based on current trends, Rockwell's valuation still remains attractive, with management expecting to convert 100% of net income into free-cash flow in 2016. In addition, Rockwell isn't engaging in significant restructuring. On the contrary, management still feels very bullish about its long-term opportunity to invest and grow its industrial Internet of things (IIoT) related solutions. In short, Rockwell offers more long-term potential from IIoT, but also more cyclical risk. What Rockwell and Emerson have in common is significant cash flow generation, and Rockwell's near 2.5% yield isn't anything to be sniffed at either. Both stocks are attractive, but I think Rockwell Automation is better. Emerson Electric is clearly the dividend hunter's choice, but Rockwell arguably offers more potential for long-term earnings and cash flow generation thanks to its IIoT-related offerings. In a sense, Rockwell's higher cyclical exposure is matched by a higher execution risk at Emerson Electric. The latter's management has work to do on engineering its restructuring, and if the market turns downward, they may find it harder to achieve the requisite value for the businesses they want to sell. I would prefer Rockwell (Cognex is also an interesting choice), but ultimately the decision boils down to your particular investment needs. If you favor growth, go with Rockwell; for income, go with Emerson Electric.